PROVIDENCE, RI – The Roman Catholic Diocese of Providence will open and staff a homeless day shelter in response to the identified need for such a resource. The day shelter makes way for the peaceful end of Occupy Providence’s encampment in Burnside Park. The day shelter will be housed at the Diocese of Providence’s Emmanuel House in South Providence, which the Diocese established as an emergency winter overflow homeless shelter in December, 2010 at the site of the former Carter Day Care facility. 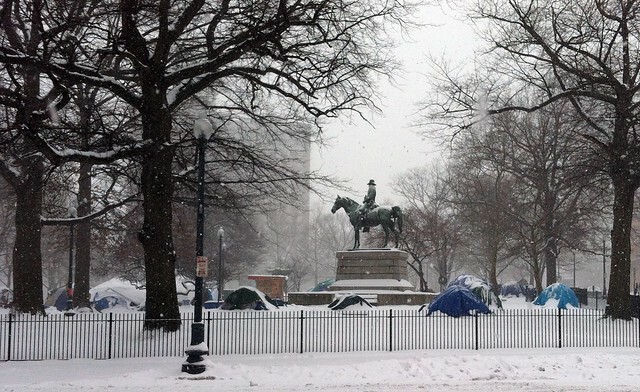 The City of Providence, though not in a position to open and resource a day shelter, was successful at convening homeless advocates and other community partners to reach a mediated resolution to Occupy Providence’s encampment in Burnside Park. Mayor Taveras expressed his gratitude to Bishop Thomas J. Tobin and the Diocese of Providence for their efforts. The Mayor also thanked Public Safety Commissioner Steven ParÃƒÂ© and City Solicitor Jeffrey Padwa leading the city’s response to the encampment in Burnside Park, which nationally distinguishes Providence’s response to the Occupy movement. “This would not have happened without the Diocese of Providence’s involvement and willingness to help in this effort, and I am extremely grateful to Bishop Tobin. I also commend Commissioner ParÃƒÂ© and Solicitor Padwa for their steady, mature leadership,” said Mayor Taveras. Providence has received national attention for the city’s peaceful and civil approach to ending the unsafe, illegal encampment inside Burnside Park. Commissioner ParÃƒÂ© has communicated on an almost daily basis with protest organizers since the occupation began on October 15. Rather than forcibly evict the protesters from park, the city has engaged in court mediation to arrive at a solution that satisfies OP’s stated commitment to end their encampment in exchange for creation of a homeless day shelter. The Taveras administration will remain focused on the truly important work at hand, in Providence and across our nation: Creating jobs, improving our schools, addressing the foreclosure crisis, and working with responsible community partners to support the most vulnerable among us. City Hall, Providence, RI- Members of Occupy Providence, homeless advocates, and other concerned citizens will assemble at City Hall to release the details of the mediation process in which Occupy Providence and the City of Providence engaged. After years of failed attempts at creating a day center for Providence’s homeless population, the City is prepared to work with the Catholic Diocese, Occupy Providence, and the Homeless advocacy community to open such a center in exchange for Occupy Providence agreeing to suspend its 24 hour a day protest. For too long, homelessness and poverty have been treated like a personal deficiency rather than a failure of our economic system. The day center is a first step in recognizing the needs of marginalized Rhode Isanders who find themselves homeless. Occupy Providence hopes this move can inspire the people of Rhode Island and the United States to realize that the voice of protest is a powerful one and that together we can achieve the changes we wish to see in our society. WHAT: Press conference to announce Occupy Providence’s victory in the establishment of a daytime homeless resource shelter in exchange for the suspension of its overnight protest, which has been occupying Burnside Park around the clock for over 100 days. Has anyone seen statistics of how many Occupy encampments there have been across the country, how many are still in existence, and how many have de-camped peacefully?